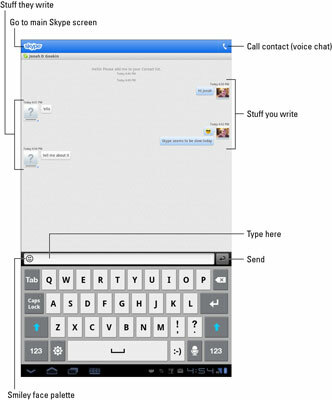 One other cell phone–like thing you can do with Skype on your Galaxy Tab is to send a text message. If you have a teenager or are one, you recognize that text messaging is perhaps the only way young people use their cell phones. Ensure that you have some Skype credit. Text messages aren’t free, as any parent without an unlimited text messaging cellular plan can attest. Summon a contact from the list of Skype contacts. Touch the Contacts icon on the main Skype screen and then choose a contact, hopefully one who also has his cell phone number listed. On the contact’s info screen, choose SMS. You see a text message composition screen. Do note, however, the per-message cost listed in the upper-right corner of the screen. Touch the text box at the bottom of the screen. You have only 160 characters to make your point. The text message is sent. The cell phone you messaged receives the text just like any other text message. The sender information, however, might be only a cryptic number. So do make sure that you identify yourself when sending the text message. The recipient can reply to the message. The reply is received in the Skype app, and it’s tracked like a text conversation. The message may not be received instantly, as it is on a cell phone. Eventually you’ll get the message. And you’ll be charged for it. To get Skype Credit, touch the Profile icon on the main Skype screen. Touch the Skype Credit item and follow the directions on screen to buy more credit. It’s possible to compose a text message from the Contacts app: When a contact’s information is displayed, touch his phone number. Providing that the Skype app is running and you’re signed in, you’re whisked off to the text message composition screen.